Located in the heart of historic downtown Waltham, Massachusetts, the Tea Leaf has been a favourite retreat for those seeking casual elegance and a relaxed haven from their busy schedules. 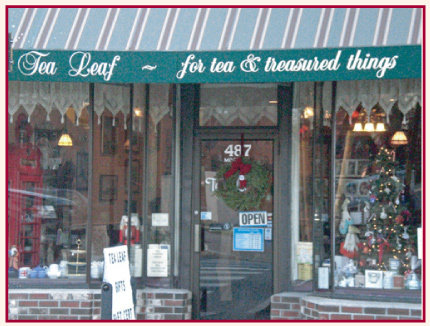 Since The Tea Leaf opened in November 2005, tea lovers throughout New England and around the world have visited our quaint tearoom while in the Boston area. The locals are “regulars” to The Tea Leaf and have embraced the unique atmosphere that it offers. Our English-style setting consists of a twenty-seat tea room offering savory lunches, delectable three-course afternoon tea and decadent desserts. We are open Wednesday through Sunday 11:30am to 5:00pm. Reservations are always required for the Tea Room, please call 781-891-1900 to make your reservations.